Colour: Deep mahogany. Nose: Rich and smoky with seaside minerals with a hint of ash and bitter chocolate drops. Vanilla follows with oily unroasted chestnuts and a hint of fudge with a malty sweetness. A drop of water adds a creamy clotted cream note with fruit appearing in the form of unripe citrus in a flan glaze. 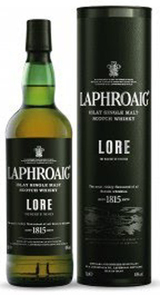 Palate: Richly peaty with a spicy chilli bite. Finish: Short dry finish and a long sweet aftertaste.